The 30-second PSAs from the U.S. Department of Education’s TEACH campaign, run by a coalition of major corporations and Teach for America, makes the profession look pretty glamorous. 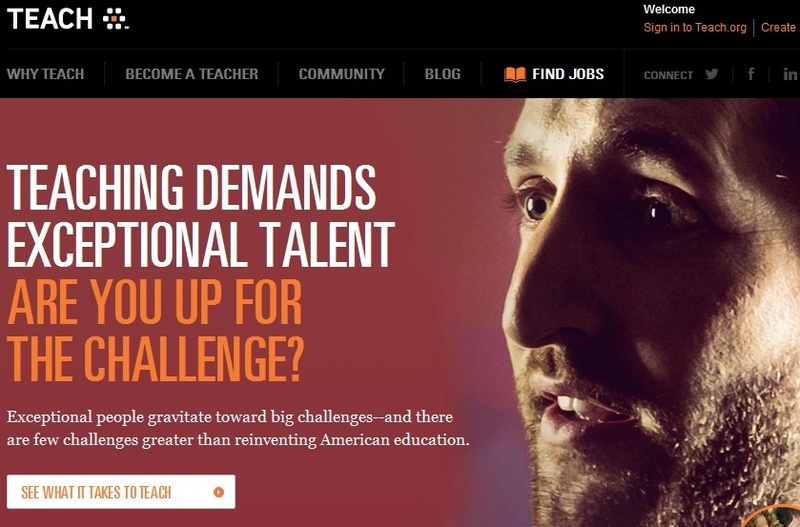 The ads are designed to attract more college grads to the field of teaching. One ad depicts students with iPads in hand, watching their teacher deliver a science lesson while he’s knee-deep in a swamp. These images are great incentives. But let’s hope that the same energy goes into supporting teachers in the classroom once they do make the choice to teach. But let’s hope that the same energy goes into supporting teachers in the classroom once they do make the choice to teach. As someone who taught eighth grade for two years and then left the classroom, I can’t speak from very many years of experience. But here’s why my teaching bubble burst. I went into teaching with rosy visions in my head as well. I wanted a classroom stage where my eager literature students would dramatize “A Tell Tale Heart.” Corny I know… but reading shaped who I was as a kid. I couldn’t imagine a more perfect career than helping other kids figure out who they are through books. It wasn’t until that first day, when the classroom door slammed behind my 32 students, that I realized the loneliness of teaching. I was more unprepared than most new teachers. I had only five weeks of training, and no student-teaching experience. And each day, I found my optimism and resilience draining. To say it was hard is an understatement. I felt like I was trying to keep the lightbulbs on in a 32-story building, by pedaling a unicycle. The teachers I know don’t want glory. They want to give something away. President Obama said his fifth grade teacher gave him confidence and reinforced the value of empathy. And being remembered for those gifts so many years later is a priceless reward. But at the end of each day, teachers are often running on empty. In my opinion, a creative co-teacher or tight-knit teaching team could fill teachers back up. My friend who taught math across town from my school partnered up with a colleague. Together, they schemed about how to motivate failing students. They created a classroom economy that used “scholar dollars” to reward great test scores and attendance. I wanted to find my own way. Questions like, “How do you get 13-year-olds excited about historical texts?” kept me up at night — in a good way. But without a partner to share my enthusiasm, I ran out of steam. If the goal of the TEACH ad campaign is to pull Millennials away from the corporate world and into teaching, then the job needs to promise a collegial atmosphere, where a large chunk of someone’s week is collaborating with other professionals. If our country is facing a teacher shortage, we need to make teaching work for more kinds of people. If the Department of Education could guarantee co-teachers for first-timers in the classroom, and support districts in giving their teachers more professional collaboration time, you could count me (back) in.